If you’re not too keen on spicy food and/or don’t like ginger all that much, just take it back a notch when you add the curry paste and fresh ginger. Half of the listed amounts would probably be about right for a milder yet still flavorful concoction. And before we let you go – isn’t it amazing how many dishes one can whip up with onions, carrots and cabbage as the main ingredients? We feel tempted to write a book proposal where the title would be “Onions, carrots and cabbage 1000 ways”. In all honesty though, cheaper and more eco-friendly items are hard to find so we’ll continue to be creative with them in the kitchen. Enjoy! Heat up 1 tbsp canola oil in a wok pan. Sauté the onions in 1/2 tsp salt for about 2 min over medium heat, before adding in garlic and ginger. Stir and continue sautéing for another few minutes. Add in carrots, cabbage and green curry paste. Mix it all together and allow to cook for 5 min, stirring frequently. Add in the frozen green beans and coconut milk. Bring to a simmer, and turn off the heat once you reach the desired consistency of the vegetables. We like ours crunchy, thus we turn off the heat as soon as everything is heated through. Add the maple syrup and season to taste. A pinch of salt is usually all that’s needed. If using frozen herbs, stir them into the pan. Otherwise, sprinkle on top. 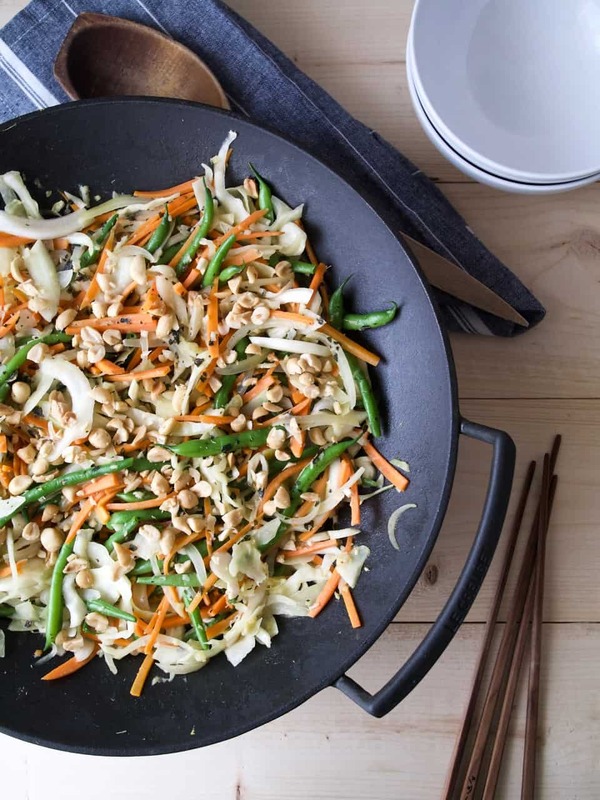 Serve the stir fry in big bowls with a grain and a handful of chopped peanuts.